A New England tradition that can be made in desert country. If you have the privilege of living along the coastal regions of the Northeast as I do or have taken a visit to the shores of Maine, you’ve probably experienced a clam bake or, at least, a clam boil as a culinary adventure. 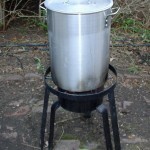 If you’re in the tidal regions of the Carolinas, Louisiana or Georgia, a clam boil is about the same as a “low country” boil (Frogmore Stew) except in New England lobsters are used instead of crabs and crawfish. 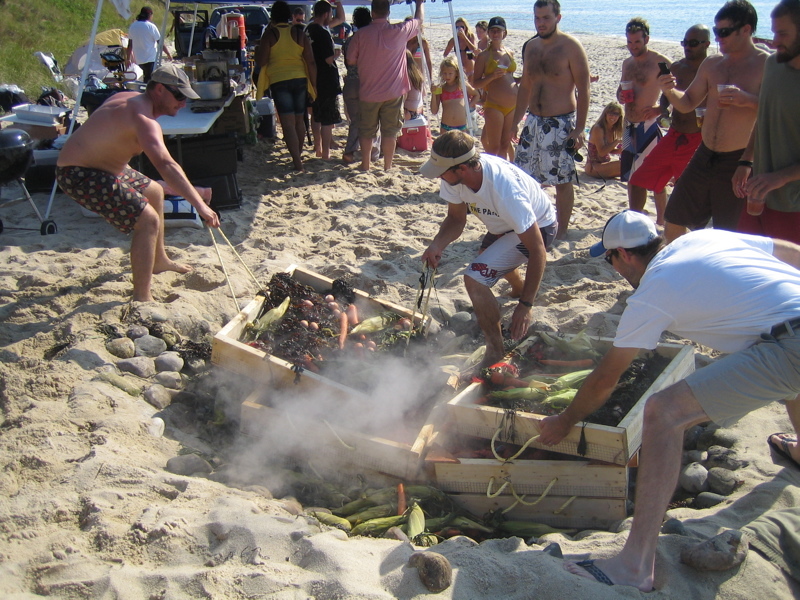 The difference between a clam bake and a clam boil is simple: a bake is done in a pit dug on the beach (or your backyard) while a boil is cooked in a large pot or on a charcoal grill. Both are delicious! The “Pope of Peppers” asked me to develop a recipe for cooking a classic New England clambake in the desert heat of New Mexico. Here’s what I created. Lobsters yield about 20 percent of their weight: a 1 1/4- to 1 1/2-pound hard-shell Atlantic lobster will yield about five ounces of lobster meat (claws, knuckles and tail)… about what goes in a decent-size lobster salad roll served throughout the New England region. Surprisingly, the yield from Spiny lobster is about the same even though it doesn’t have claws. 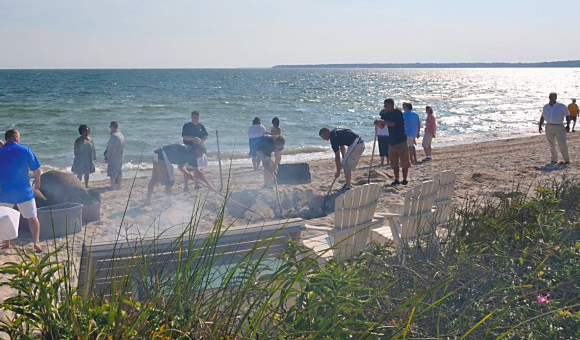 A clam bake begins with gathering seaweed (Rockweed) that’s attached to the rocks along the shoreline and digging a pit, usually about three by five feet and a couple of feet deep (about the same size as a pig roasting pit if you happen to have one!). Gather about a couple of dozen or so medium-size (softball-size) stones to heat in the fire. You’ll also need wet burlap sacks and a tarp to trap the steam. Once the stones and seaweed have been collected, prepare the fire with hardwood (or driftwood if you’re fortunate enough to be on the beach). Some prefer to simply start a fire in the pit atop the stones, while others line the pit edges and bottom with stones. The stones used for cooking are placed in the center of the pit and the fire is started. The fire needs to burn until the stones are hot, about an hour or so. A layer of wet seaweed is placed over the stones, followed by traditional regional foods such as steamers, mussels, quahogs and lobsters. Side dishes usually include unshucked corn on the cob, sweet onions and sausage (linguiça, andouille or chouriço). Alternating layers of seaweed and food are piled on top and the entire mound is covered with wet burlap sacks and a tarp to contain the steam. The food is allowed to steam for a couple of hours until everything is fully cooked. 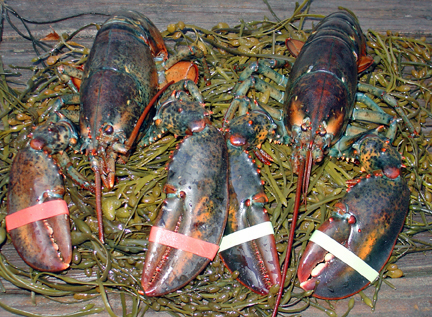 If your fish monger doesn’t have Maine lobsters, there are several on-line sources (most from Maine) but be warned lobsters need to be shipped via next day service so they tend to be a bit pricey… expect to pay about $100 to $150 for two 1 1/2-pound hard-shell lobsters (the price includes next day shipping). Rockweed is also available on-line but it’s also expensive… 30 pounds of Rockweed will set you back about $120 plus shipping. If you don’t want to pay for Rockweed, purchase some dried seaweed in the Asian section of your supermarket and rehydrate it in salt water. The taste isn’t quite the same but it’s pretty close. Somewhat less labor intensive than a clam bake is a clam boil where everything is steamed in a large stock pot. The flavor is almost, but not quite, the same. 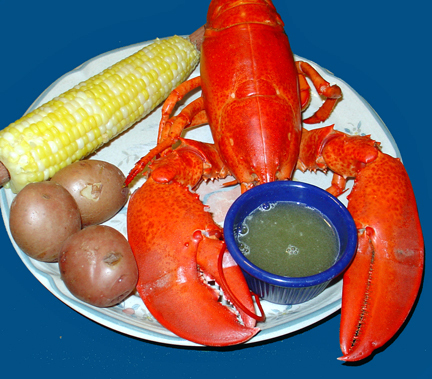 (Optional items for the clam bake/clam boil include mussels, hard-shell clams, jumbo-size shrimp, sweet onions, Red Bliss potatoes and cherry peppers.) Although you could boil all of the ingredients a better method is to steam everything. 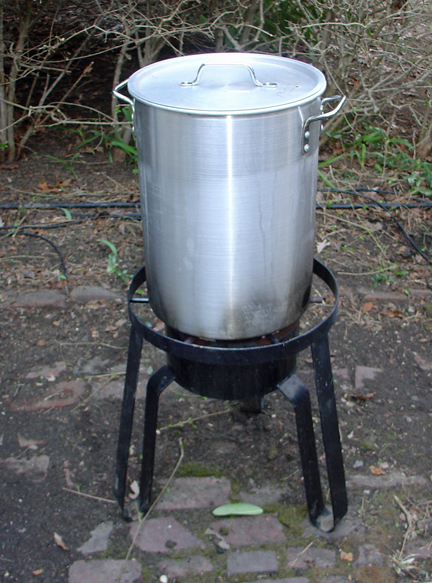 To do a clam boil you’ll need a large (21- to 30-gallon) stock pot, a steamer basket and a high pressure propane cooker (such as a turkey fryer). If you don’t have access to sea water, replicate the 3.5% salinity by adding four ounces of kosher salt (about 1/3 cup) to one gallon of filtered or bottled water. Don’t worry about not having the other minerals naturally occurring in sea water. If you don’t have sea water, combine the water and salt in the stock pot. Stir to dissolve the salt and bring to a rolling boil. (You could also add a couple of tablespoons of Old Bay Seafood Seasoning or crab boil seasoning if you’re so inclined.) Place the steamer basket in the stock pot. Add a few handfuls of Rockweed. Reduce the heat keeping the liquid at a low boil. Cover until the water begins to steam. Add the potatoes. After about five minutes, add the corn. Cover and steam for five minutes. Drain the steamer basket and pour out onto a newspaper-covered picnic table similar to a crawfish or low-country boil (or get fancy and plate everything on several large platters). 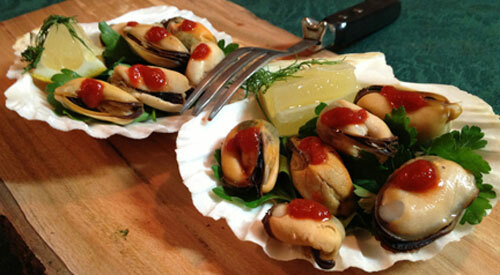 Serve with grilled lemon halves, strained cooking liquid (for rinsing the clams), drawn butter and a lot of cold beer. This could also be prepared in a kettle-style grill by starting a fire with hardwood charcoal and adding the rocks. Let the rocks get hot and the coals ash covered… about an hour. Rake the coals to remove the ash. Add the seaweed and layer the potatoes and onions atop the rocks. Add more seaweed and the lobsters, sausage and shellfish. Add more seaweed. Cover and cook for about 45 minutes or until the shellfish have opened, the lobsters are bright red and the potatoes are knife tender. “Drawn” butter is simply butter that has had the milk solids removed leaving a clear elixir of pure butter. It may also be used for sautéed food as it has a higher smoke point than regular butter. (Also known as clarified butter or Ghee in India, the butter will keep, covered and refrigerated, for several weeks.) I like to enhance mine by adding garlic and parsley. If serving with seafood, a tablespoon or so of lemon juice could also be added. Clarified butter is also excellent for preparing Hollandaise sauce. 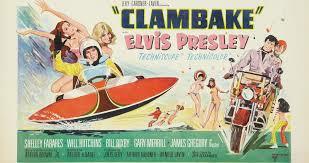 And here is where you can spice up your clambake by adding cayenne pepper to taste. Melt the butter in a medium saucepan over medium-low heat. Bring to a simmer and cook for about five minutes being careful not to brown the butter. Skim off the foam. Add the garlic and simmer for two minutes. Again, skim off any foam. Remove the saucepan from the heat and strain the butterfat through a cheese cloth lined strainer into a heat proof container leaving the milk solids at the bottom of the saucepan. Add the parsley and stir to combine. Store, refrigerated and covered, for up to a month or freeze for up to six months. Grilling lemons help to release the juice and adds a nice charred flavor to the citrus. Prepare the grill (or a skillet pan) for medium-high cooking. Remove any visible seeds and sprinkle the flesh of the lemons with salt. Place on the grill and cook for three to five minutes until nicely charred. Carefully remove the lemons and serve with seafood or roasted vegetables.